Utah Dugway Geodes Shipped Whole Approx 1.5 lbs. Polished Half Geode Products will vary but are approximately fist sized. Very nice polished edges, perfect for display. Known for their usually drab and almost ugly exterior while the inside contains a fun surprise – often a hollow pocket lined with crystals. The beautiful insides are a wonderful contrast to the dreary outside and each one is unique and often stunning. Geodes frequently form from volcanic activity. Over millions of years, trapped gas inside the volcanic cavities along with moisture seepage caused chalcedony “fortification” or agate to line the cavity. As moisture seepage slowed, crystal formations continued to grow, creating very beautiful and various interiors. Most geodes are predominantly quartz but calcite is also common while other minerals occur but much less frequently. Quartz geodes often consist of concentric layers of several varieties of quartz, such as chalcedony, agate, common opal and crystalline quartz. The thickness of the layers and they types of minerals found varies by the location and the history of the formation. 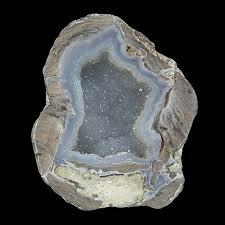 Many geode localities occur in desert area and are elluvial, meaning the geodes have not been transported by water. 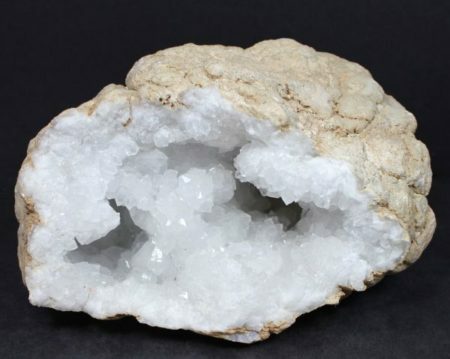 Geodes are often “cracked” open using a hammer and an old sock to contain any flying rock chips. Gentle tapping around the circumference will often allow the geode to break open without much damage. If you have access to a tile saw, that is a great way to open your geode as well.